ATTENTION! ATTENTION! ATTENTION!! The missing link has been found Between The Dough Boys and The Dictators, and they’re here to rock yer socks off!! Listen to the first cut, first nasty lick, first fierce, nasal vocal from the new album (produced by the Doors’ Robbie Kreiger, Geza X, and the band) by the legendary 70’s punk/glam/rock ‘n’ roll band The Mau Mau’s, and you will be in Punk Rock Heaven (is there really a Rock ‘N’ Roll Heaven?). The guitars sound like shrapnel shards exploding from a landmine and the rhythm section is down and dirty like two whirling dervishes on a mission. Then there are the vocals: Warped, nauseating, gruff, and other-worldly. All total, just the right mixture for a goddamn, attitude-driven, snot nosed punk rock band! I’m on my first of what willzbe several listens of The Mau Mau’s (they get a gazillion points for one of the best band names ever) first album in quite a few years, and I’m just… vibing!! My typing skills are minimal (two finger typing), but listening to this amazingly cool album I’m, “typing to the beat!” Something like a bazillion words per minute, right along with the manic beat that The Mau Mau’s have burned onto this party platter. Heavy stuff! You might think that a band with so much road under their heels would rest on their laurels, or make an album with a couple of decent songs and the rest just mush. Well, Scorched Earth Policies: Then & Now is ALL KILLER-NO FILLER!! You will not want to stop this disc from playing ‘til you squeezed all of the friggin’ musical mojo outta this mother! 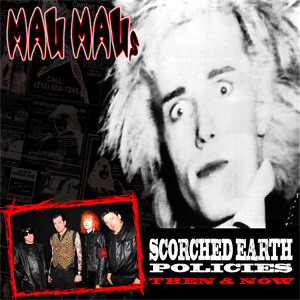 Where the Dictators shouldered heavy metal as a means to commercialize their punky pop, and NJ’s Dough Boys gave us some of the heaviest punk riffage this side of the Ramones, The Mau Mau’s inject wit, economy, intelligence, and classic pop structure into raw, powered punk rock. Not that the other bands I mentioned didn’t possess the same elements, it’s just that The Mau Mau’s mojo is definitely their own. Period. Bottom line, this album is a fun-filled blast of riffs and roars that rock like crazy! It’s a credible continuation of what’s come before, and a hard look into the future. It doesn’t get any more neanderthalic and fun than this .